Are you ready to take the next steps on your journey in either Christian Discipleship or Servant Leadership? If so, there are two remarkably similar volunteer/lay-led retreat programs that I hope that you will consider. Wood Badge is advanced leadership training for adults in the Boy Scouts of America. 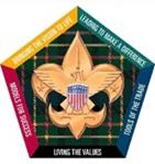 It truly is “leadership” training that is simply delivered in a Scouting setting, because the foundational principles that help Scouts grow as leaders can help adults, as well (http://www.woodbadge.org). The Walk to Emmaus is a non-denominational Christian experience, intended to truly fan the flames of the Holy Spirit in ways that many people describe as being almost as powerful a catalyst in their walk as their initial surrendering to Christ (http://emmaus.upperroom.org). To be clear, Wood Badge is not Christian-centric, nor are there any other direct connections between the programs. My hope is that by sharing some parallels, those that may have realized the blessings of one might consider the other. Download this flyer to see more about how the programs compare. Both are a retreat, in order to help you truly focus on your own growth – you will come back changed! Both use small groups to help you build life-long bonds as you experience new ideas together. Both are structured curriculums that are delivered in your local area by volunteers who have been where you are. Wood Badge curriculum is from the Boy Scouts of America, but then taught by a volunteer staff. Each lesson has key points that are consistent but then adapted by the personal experiences of the speaker. Emmaus curriculum comes from the Upper Room and is then taught by a lay-led staff, with a handful of clergy. Each lesson has key scripture and core ideas that are then adapted by the personal experiences of the speaker. Both have opportunities to re-experience and refine your learnings while serving in future events. Recent Wood Badge graduates can serve as Troop Guides for new participants or behind the scenes as Scribes or Quartermasters; and in later courses as SPL, ASM’s or Scoutmaster in future courses. Recent Emmaus pilgrims can serve as Table Leaders for new pilgrims or behind the scenes in the “Outside” or “4th day” teams; and in later weekends as ALD’s or Lay Director in future courses. Both foster communities for fellowship, but are intended to better equip you to serve those in your normal world. Wood Badge graduates are recognizable by the wooden beads on their uniform, but it is not a clique. The purpose of WB is to grow leaders that can then go serve their Scouts, their families, their churches and their workplaces. Emmaus has reunion groups and other fellowship events, but the purpose of the Emmaus experience is to help you grow as a Disciple of Christ and leader in service to God, your family, church, and the world. CALL TO ACTION: If you are a Christian Scouter who has experienced the blessings of either of these programs, then you know how powerful they can be. Please consider taking the other journey as well. Search the web for “Emmaus” and your local major city … or ask about Wood Badge from your BSA Council representative. And if you want a truly remarkable Wood Badge experience – consider taking Wood Badge at Philmont!! Each year, Circle Ten Council hosts a course that is available to all Scouters. Check out www.WB110.org for details about the August 2014 course. – If a CA is unable to attend a campout, they are still responsible for ensuring that an SOS still occurs during the campout, including the preparation and the debrief. It also includes two signature sheets: one signed at the beginning of the term of service (acknowledging expectations) and the second signed at the end of service for completion. The Guide is a work-in-progress, with this being the first draft for considered use this Fall & Winter. I will update the guide after lessons learned, as well as after suggestions offered by Scouters on the Internet. As always, thanks for reading and your feedback. Many Cub Scouts initially earn their purple knot (youth religious award) through God & Me for 1st-3rd grade – but don’t continue through the progressive program for higher ages. By the time that they are Webelos or Boy Scouts, they often have so many other activities that they (or their parents) don’t want to sign up for 6 to 8 weekend meetings. So, in our district, we tried delivering the God & Family (4th & 5th grade Protestant) program as a weekend lock-in. The boys checked in at 6PM Friday and walked out 4PM Saturday, with the next part of their discipleship journey complete … along with some new purple knots or gold pins. Click here to download a Guide to How to Deliver a God & Family Lock-in. My hope is that you’ll consider delivering this in your own Councils and Districts – and provide feedback for how we can improve the guide. Good Scouting and Many Blessings! All religious courseware and programs are prescribed by the various religious institutions that have chosen to develop them. The programs are not created or maintained by the Boy Scouts. BSA simply approves the program structure and provides a method of recognition via the Uniform Knots for Scouts and Adults. Religious study programs that are designed for 3rd grade youth can be used to satisfy the rank requirements for Bear. the scout must do one of either Activities 1 (Ways we Worship) or 2 (Emblems of Faith). Guidance based on the BSA Bear Handbook (2006 edition) – pages 24-33. If you know of other resources related Religious Programs, Awards or Rank Advancements, please let us know ! The Tiger Rank does not have a religious participation activity, however religious study programs that are designed for 1st grade youth can be recognized by the used to satisfy the rank requirements for Tiger. Religious study programs that are designed for 2nd grade youth can be used to satisfy the rank requirements for Wolf. Know. What is “faith”? With your family, discuss some people who have shown their faith – who have shown an inner strength based on their trust in a higher power or cause. Discuss the good qualities of these people. Give two ideas on how you can practice or demonstrate your religious beliefs. Choose one and do it. Find out how you can help your church, synagogue, mosque, temple, or religious fellowship. Guidance based on the BSA Wolf Handbook (2006 edition) – pages 94-99. Religious study programs that are designed for 4th and 5th grade youth can be used to satisfy the rank requirements for Webelos. To complete the WEBELOS RANK, the scout must do requirement 8 (Faith). Guidance based on the BSA Webelos Handbook (2010 edition) – pages 49-51, 68-69. * Of notable mention in the BSA guidelines, if the scout earned their religious emblem (purple knot) as a Cub Scout, they must either earn the Webelos award or the activities of 8e. Also, completing the activities of 8e does not qualify the scout to wear the religious emblem of their faith or a purple knot. Religious study programs that are designed for 6th thru 12th grade youth can be recognized with the Boy Scout-specific metal ‘device’ (pin) is available for the Purple Scout Religous Knot, BSA part number 05007, and the respective Boy Scout, Varsity, Venture or Sea Scout pins. While a formal religious activity is not required for rank advancement, having a healthy faith is a mandate for each scout that can be examined during the Board of Review or Scoutmaster Conferences, based on how the scout is “Living the Scout Oath and Law” (which is expressly defined). See also the Boy Scout Oath and Law.